Local government in England is faced with probably the biggest challenges it has had since at least the end of World War II, if not longer. Not only is it facing front-loaded cuts to its income of an unprecedented scale, but the demand for services, especially for the elderly, continue to rise and in many areas the return of mass unemployment, especially amongst young people, threatens new problems. What can history and experience teach us about how to cope in what seem to be pretty unprecedented circumstances? While history cannot ever be a total guide, especially when there is no exact historical precedent, experience can help to guide us about what may be possible and what has worked, and what has not, in the past. The nearest equivalent to the current crisis was the wave of fiscal austerity that engulfed many local governments across the developed world in the early 1980s. Whilst the scale of the cuts in the UK in the late 1970s and early 1980s does not match the current situation, in some other countries they did. Between 1978 and 1985 – a seven year period – central government grants to local government declined by 15% in the UK and 18.5% in the USA. This compares to proposed cuts in England of about 12% in year one (2011-12) and 27% by the end of year four (2014-15). That is over triple the rate of decline – 6.75% a year average now compared to 2.1% a year average then, and with this round of cuts significantly ‘front-loaded’ which generates its own set of problems. Some of the responses to the previous local government crisis in the 70s and 80s were documented in a major research effort across 10 Western countries that studied 2,500 local governments, and we draw on some of those experiences here – although we have developed our own interpretation that includes much other work. In the previous studies, about a third of local governments responded to the (much smaller) 70s and 80s fiscal crisis by trying to ‘get’ more by raising taxes and slightly more by raising additional revenue in other ways – e.g. raising user charges, using up reserves, getting additional grants, selling assets, and borrowing. When it came to spending, the most popular strategy was across the board incremental cuts (about two fifths of local governments chose this strategy) whereas making strategic cuts to programmes was much less popular (only less than one fifth chose this strategy). One thing it is worth noting is that in most cases local government saw the late 70s-early 80s crisis as just that – a temporary crisis caused by economic conditions that would pass. And indeed in most cases local government finances did return to levels close to what they had previously been once the crisis was over. It seems to be the intention of the Conservative-Liberal Democrat coalition that the current (much larger) cuts will be permanent. This has big implications for how local government deals with the cuts. One strategy that might be tried by some is to challenge the way in which central government funding streams are allocated. With substantial changes to the ways in which this is done – including reducing the number of funding streams and concentrating much more through the central funding stream – some obvious anomalies have been thrown up. These changes and anomalies may be sufficient to allow for challenges, even legal ones, to the funding allocations. The rushed way in which many of the changes have been conducted probably makes this more possible and some Councils are apparently considering seeking judicial review (others are already seeking judicial review of cuts in the ‘Building Schools for the Future’ programme). Scope for varying community charge is in practice very limited and is going to be limited still further by the introduction compulsory referenda if councils want to put the charge up. User charges will probably be a favourite for many Councils, including car-parking. Ironically the Government have just announced they are “freeing up” to allow councils to reduce them in order to “end the war on the motorist” – not much chance of that. Most Local Governments will use their new freedom to move parking charges up, not down. Of course user charges also raise major values issues about what Councils are for – and they are in any case limited to non-statutory services as well as political limits about what the public will see as acceptable. Selling assets and/or borrowing money are other obvious avenues, but the former have often already been exhausted in previous efficiency drives and the latter only makes sense if the current cuts in central government support are seen as temporary. This seems unlikely – these cuts are meant to be permanent. These are of course not mutually exclusive. and we have set out the broad choices in a matrix (see Figure 1). The “size of cuts” estimates applied to each ‘box’ are obviously heuristic rules of thumb, but from the evidence of past experience with cuts and efficiency programs these seem to be realistic. Where do councils fit on this matrix? Now the Department for Communities and Local Government has published detailed figures for each council for at least the first two years, we can get some idea of which councils face which choices. DCLG based their figures on its new preferred measure of councils ‘estimated revenue spending’, which includes changes to council tax and about £1bn of NHS support for social care. We have used these figures, not because we believe them to be correct but because even on these ‘watered down’ estimates of the cuts the size and scope of the options facing councils starts to emerge clearly. These cuts have been front-loaded, but we estimate that, over the full four years, dozens of councils will move from Category A to B and from B to C. Councils like Manchester, Liverpool, South Tyneside and Hackney will move up into the 20% plus category. Of the top group (Category C), nine of the twelve councils actually face cuts of more than 30%, two of over 40% (Barrow-in-Furness and Hastings) and one of a staggering 50.9% (Great Yarmouth). Remember these estimates are based on the DCLGs preferred measures, which have been sharply criticised. They are distorted because of the inclusion of estimated council tax revenue increases and especially because of the inclusion of NHS social care funding. This disguises the probable real impact of central government funding cuts, which are much larger. If these were discounted then many more councils would move into categories B and C.
By 2014-15 then we estimate that most councils, including most of the biggest ones, will probably be facing Category C scales of cuts and most of the rest Category B. This gives some idea of the scale of the challenge facing local government. From a citizens’ perspective, most people will probably be living in council areas facing Category C levels of cuts. Cuts have historically most often been carried out as limited, incremental, ‘salami-slicing’ across all budgets – let’s just slice 5% off across the board. This ‘reverse incrementalism’ has obvious advantages – it appears to be even-handed or fair (“we’re all in this together”); it doesn’t involve any hard political choices over priorities; and it’s simple. Whilst this strategy may ‘work’ for relatively small levels of cuts (say around 5%) history suggests that as the ‘slices’ get larger so the disadvantages also become manifest. Some services may be more vulnerable to larger cuts than others – some may simply start to become unviable or violate statutory rights. In other cases it may soon become apparent that some services represent real priorities for politicians or the public and this level of cuts is simply unacceptable and they would rather see other things cut more (or even entirely). And, from a managerial/organisational perspective, experience suggests some cuts on this scale may have unintended consequences that induce bigger problems elsewhere. Without some time-consuming ‘whole systems’ analysis these problems are hard to predict. When incremental cuts won’t deliver, ‘strategic’ cuts become more urgent. By strategic cuts we mean making big choices about what to fund and what not. It is the latter, deciding not to fund something that up until now has been deemed worthy of support, which often causes the biggest political difficulties. On the other hand, closure of some services can be managerially much simpler than large-scale salami-slicing. Although again, the costs of closure need to be considered – central government has encountered problems with it’s “bonfire of the quangos” which in the short-term is probably going to cost more than it saves because of redundancy and other costs (see the recent report from the Public Administration Select Committee). This is because services – especially ‘human’ or ‘personal’ services which includes most public sector activity – are much more difficult areas in which to achieve big productivity or efficiency gains because of the nature of the work being done. Big gains come mostly from technological improvements – like replacing a lot of men with shovels by a mechanical digger – which are hard to do in human services. The productivity gains for the economy as a whole include both operational efficiency gains and more radical investment and transformational change initiatives. So it seems reasonable to assume that possible productivity or efficiency gains in service sectors would be hard to push beyond 1-2% a year. By radical efficiencies we mean “whole systems” or transformational change that alters fundamentally what is done or the way in which it is done – for example by radically increasing the contribution of “co-production” by users of services. These sort of changes are much more difficult to obtain than operational efficiencies, take time to plan and implement and often require ‘front-end’ investment. They are also not ‘frictionless’ and can lead to short-term drops in performance, requiring even more (short-term) resources to avoid. There is evidence that they can, in some cases, lead to bigger savings but these are often based on isolated examples or from very different contexts and are not entirely reliable. 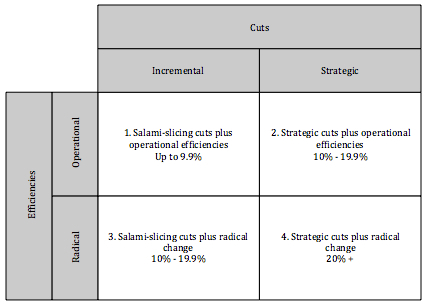 Most councils, on our analysis, are already faced with choices (2) or (3) in our matrix, which essentially means they have to answer the question – do they place most emphasis on strategic cuts or radical efficiencies? Strategic cuts, which mean closing down or severely curtailing things that have hitherto been done by councils, have been avoided in the past because the ‘losers’ tend to complain – loudly – whilst the ‘winners’ do not reward councillors. On the other hand radical efficiencies are much more organizationally and managerially challenging, and risky, than strategic cuts. Radical efficiencies are of course politically easier than strategic cuts. They mean that councils should be able to continue – over the medium term – to provide reasonably similar or slightly reduced levels of services without the need to completely abandon whole areas of activity. But as discussed above they are neither costless nor frictionless and take time to implement. For a large group of councils – and maybe for most councils in the next four years – this dilemma does not exist because they are faced with cuts of such a magnitude that they will have to do both – achieve strategic cuts and radical efficiencies. Some will opt for a ‘smaller but more flexible’ strategy of the type being pursued by Manchester City Council. They aim to slim down their workforce but at the same time undertake major reorganisation and retraining to radically boost productivity. Others, such as Essex County Council, are going further down the outsourcing and ‘big society’ route to divest themselves of some services partially or entirely. Whatever the strategic choices made, it is clear that English local government faces the biggest upheaval since at least the travails of the Poll Tax and probably for many years before that. Respectively, professor of government (School of Social Sciences – Politics), and lecturer in public policy and management (MBS). Mouritzen, P E (1992) (Editor) Managing Cities in Austerity – urban fiscal stress in ten western countries, Sage. We have excluded the ‘transitional funding’ that some councils are getting, because this only lowers the size of cuts for one year and disappears after that. So the size of the strategic problem is the total cut after two years. For a discussion of the productivity/efficiency relationship see Talbot, C (2010) Theories of Performance, Oxford University Press. See Gillinson, S; Horne, M and Baeck, P (2010) Radical Efficiency – different, better, lower cost public services. Innovation Unit/NESTA. ← “Investing in Britain’s Future” Not so much.